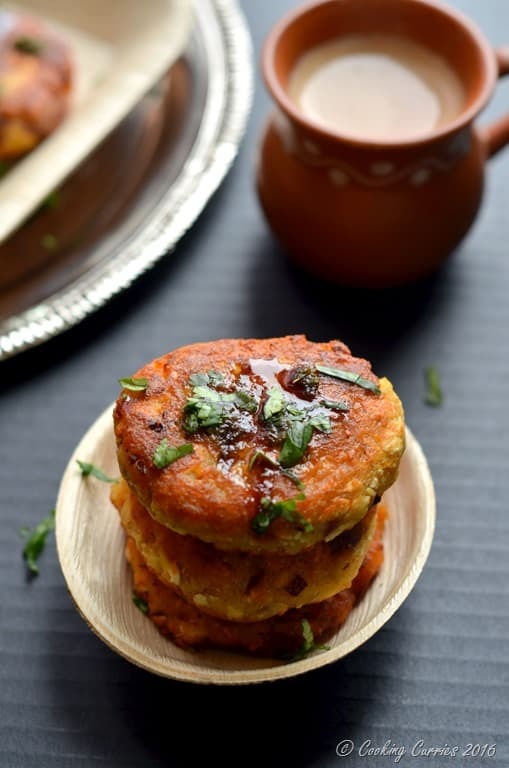 Hot savory Paneer Tikkis with the slight sweetness of Butternut Squash topped with an assortment of chutneys is the perfect accompaniment to chai on cold and rainy days. Its been a rainy few days here in good old Seattle and that is just not helping with the post vacation blues and the jetlagged me is finding ways to cheer myself up and the rest of the family as well. The husband complained of sitting in his car for over an hour yesterday morning, because of the traffic. You would think Seattle know how to drive on rainy days, right?! But, no. Everyone goes crazy and drive at 10 mph slower than a safe speed limit and it just becomes horrible to be out on the road. I was home all day and even ordered some groceries that I needed through Amazon Prime Now, because I couldn’t even think of getting out in the rains. Even just sitting inside the house, all dry and what not, the rains still got the better of me. All that I made yesterday was some chivda – savory beaten rice flakes, that I had with my mid morning chai and then come evening, I craved for something hot and savory. Preferably fried. That’s when I looked up my “recipe idea book” and I had a lot of different ideas for tikkis in it. Unfortunately, I did not have all the ingredients for any combination of tikkis I had jotted down. 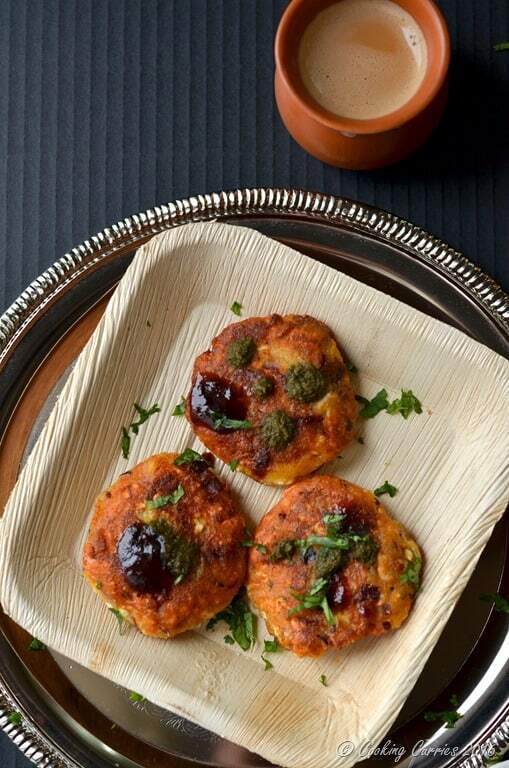 I looked into my sparsely filled refrigerator and the pantry and decided to make this Paneer Tikki with some seasonal butternut squash. 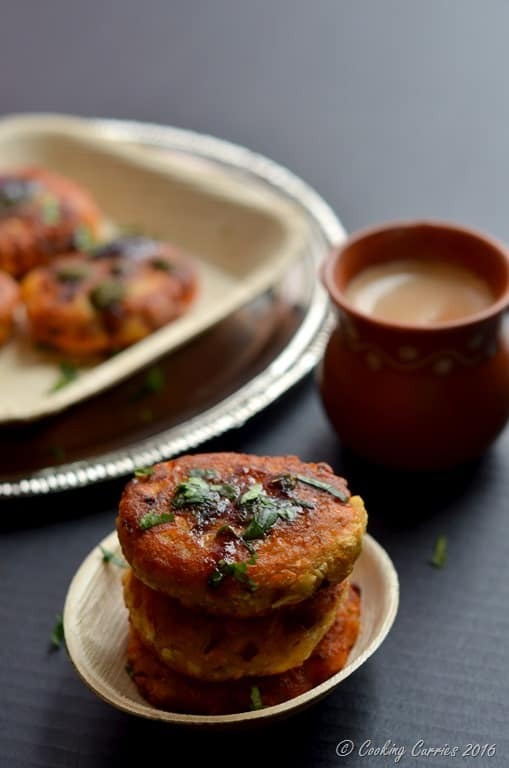 As I started making them and they sizzled on the pan and the chai was simmering away, it was such a peaceful moment that started pushing my rainy day blues away. Some good music on the SONOS and I was all set. I shared it on my Instagram stories as well. Do you follow me on Instagram yet? You should! I am @CookingCurries and I share a lot more of my everyday life in the kitchen on it along with the new recipes that come up here on the blog. 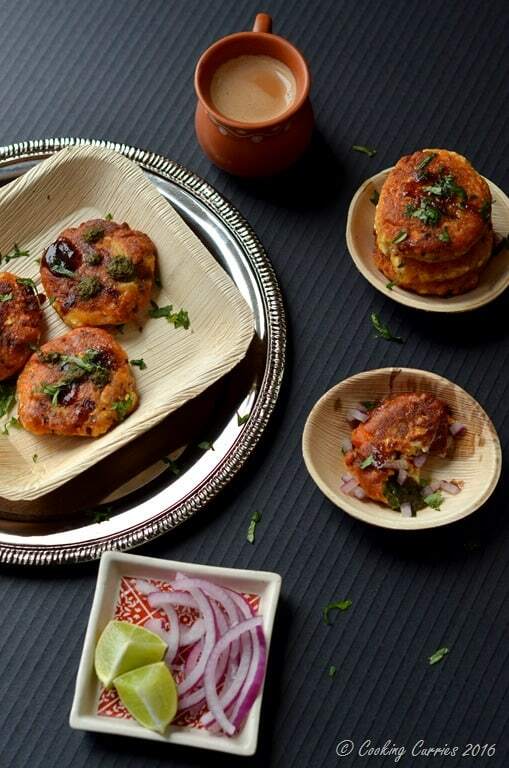 The weather forecast for the next days is also cold and rainy, for Seattle and that’s your perfect excuse to make these delicious Paneer Tikkis. Cook the potatoes and butternut squash in boiling water till very soft. Drain well and keep aside. Mix the potatoes, squash, grated paneer, onions, garlic, ginger, salt, cayenne, garam amsala, chat masala, amchur and 1/4 cup besan. The besan is to essentially hold the mixture together, in place of egg. Keep adding more besan till you feel that the mixture can stand to be a patty. Heat the oil over medium-high heat in a shallow pan. Make lemon sized balls of the paneer-squash mixture and flatten them with your hands to be about 2 inch diameter patties. Place 3-4 patties in the pan, depending on the size of the pan. Just make sure that you don’t over crowd them. Let them fry on one side for 2 minutes or so. Turn them over and let it brown on the other side as well. 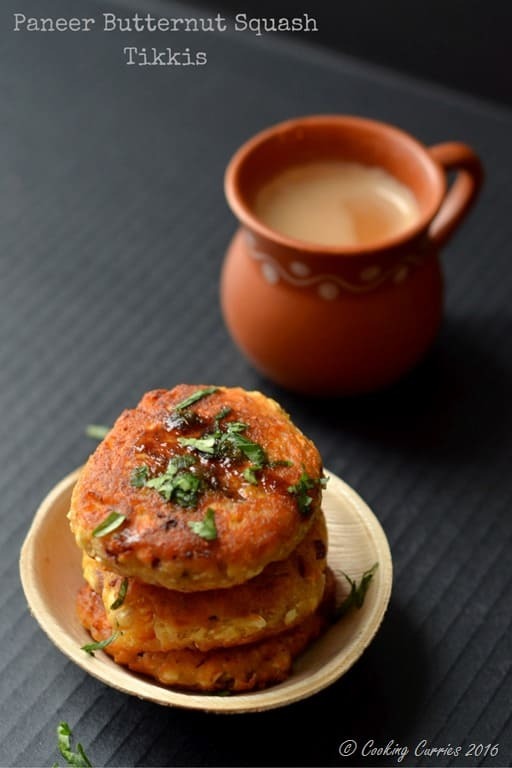 Serve hot with the chutneys and a hot hot cup of chai and bid rainy day blues good bye!